So I'm a baaaaad blogger......it's been a while....a sad long while! Especially since one of the last times I blogged I promised I would be back to it and well.... epic fail.... so I have a lot of time to make up for! I will try to blog a bit more and I will try to get back into being more creative with my cooking and baking. I realise I let this go last year when I became busier with work, and although I did make some fab food, and cook some new recipes I failed to share the delightfulness with you lovely folk! Then not long after in July both Scott and Anita shared their birthday weekend. After a day full of monkeying around at Go Ape we presented them each with their own cake. Anita received the brightest most cheerful butterfly we could possible think of! We reverted to our young girl days when we covered this one with sprinkles! And Scott thought he could trick us by requesting an upside down pyramid cake. Well next time he needs to learn to be more specific and ask for his cake to be 3D. See Scott's pyramid below complete with little Scotts riding camels! Scott's cake is made from vanilla sponge, the butterfly body is the same vanilla sponge, the wings are from a wholemeal chocolate sponge recipe. 1. Heat the oven to 180C/ fan 160C / gas 4. Butter and line the base of a 18x28cm cake tin or tray. Put the butter and sugar into a bowl; beat together with electric hand beaters until light and fluffy. Add the eggs a little at a time, beating well between each addition. 2. 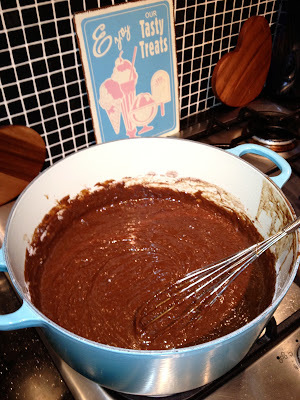 Sieve the flour, cocoa and bicarbonate of soda into the bowl, then tip in any left in the sieve. Pour in the natural yogurt. Stir everything to a smooth mixture and spoon into the prepared tin. Bake fo 20-25 mins until just firm and shrinking away from the sides of the tin. Cool in the tin for 5 mins, then turn onto a wire rack to cool completely. 3. Once cooled completely ice. In this case we covered it with homemade royal icing then the rolled fondant. We stuck the chocolates and sprinkles on after brushing on some edible sugar glue. Now that I'm going through my foodie pics...I'm realising I took a lot more baking photos then cooking ones! Ach well! Here's another cake! We were heading over to a friends place for dinner (Thank you Angela and Bruno for introducing us to Portuguese Old Lady Deliciousness!) and I thought since they were treating us to dinner I would provide the dessert. So I found this lovely Chocolate Fudge Cake recipe and thought I would give it a go! I have to say it is one of the most moist and gooey cakes I've made! It's also your lucky day because I found the recipe....check it out after the photos! 1. Heat oven to 160C / 140V fan/ gas 3. Line a 22x22cm square tin with baking parchment. 3. Now make the icing! Gently melt together the icing ingredients in a heatproof bowl over a pan of barely simmering water, then chill or cool until spreadable. 4. Now to decorate!!! Carefully turn the cooled cake and peel off the baking parchment. Spread the icing over the top...I had extra so I also let is drip lovingly over the sides! Then I drew some stars on parchment paper and cut them out. I put the stars around the cake and used a loose leaf tea strainer to sprinkle icing sugar over the cake. Then I carefully peeled off the stars. Another option would be to cover the cake in colourful sprinkles! Then not long after this Justin was in the kitchen making Chicken Nasi Goreng! We sometimes shop at the local Waitrose (largely to avoid the students in Tesco since it's a small shop and they eat everything before you can get there...) and we often pick up their free recipe cards at the till. That's where this recipe comes in! Photo of Justin in the kitchen and recipe following! P.S. I do enjoy when Justin is in the kitchen!!! 1. Heat a splash of oil in a large non-stick pan or wok and once hot pour in the beaten eggs and cook for a couple of minutes on each side to make a large, thin omelette. Slide onto a large plate, roll up and cut into thin ribbons. 2. Add the rest of the oil to the pan and cook the pepper for 2 mins. Add the greens and cook for a further 3 mins on the highest heat so any water released by the greens evaporates. 3. Stir in half the chillies, the salad onions, rice and chicken and continue to cook for a further 5 mins until piping hot. 4. Stir in the soy sauce and chilli sauce and divide between bowls. Put some of the cucumber on top, and the omelette ribbons and any remaining chilli. nom nom nom is all! Following this I made some homemade pierogies. Pierogies are one of my all time favourite foods that I have been eating since I was young! They are surprisingly simple and easy to make and don't require too many ingredients. After boiling mine (which essentially cooks the dough) I like to fry them up with some onions and bacon and serve them with sour cream - sometimes we like to have some delish Polish sausages from the local Polish Deli along with the pierogies! the finished product! eat that with some sour cream! nom nom! 1. In a large bowl mix together flour, eggs, sour cream, 1/2 cup of water. Beat the eggs as you mix and after that slowly add the rest of the water. 2. The fun part!! Lift the dough out onto a floured surface and knead it using a drop technique (lifting off the counter and dropping it again!) Knead only enough to blend the ingredients 3-5 mins, making sure not to over knead it! Wrap the dough ball in plastic wrap and leave for 20-30 mins while you prep in tasty filling! 1. Put the potatoes into a pot, and cover with enough cold salted water to soften them, boil for about 20-30 mins. 2. While the potatoes cook, melt some butter in a pan and add chopped onion and garlic, cooking slowly just until the onions are translucent, about 2 mins. Then turn the heat down and cook until caramelised, about 20 mins. You may need to add a bit more butter through this process. Also add some salt and pepper to flavour!! 3. Once the onions are done, set them aside to cool. At this point the potatoes should also be done, drain them, and squeeze out excess water. Mash them to get all the lumps out, then add in the onion mix and shredded cheese, mix together! Add some salt and pepper to taste! 1. Put the filling aside to cool while you roll out the dough. On a floured surface, roll the dough to about 1/8 inch thick. 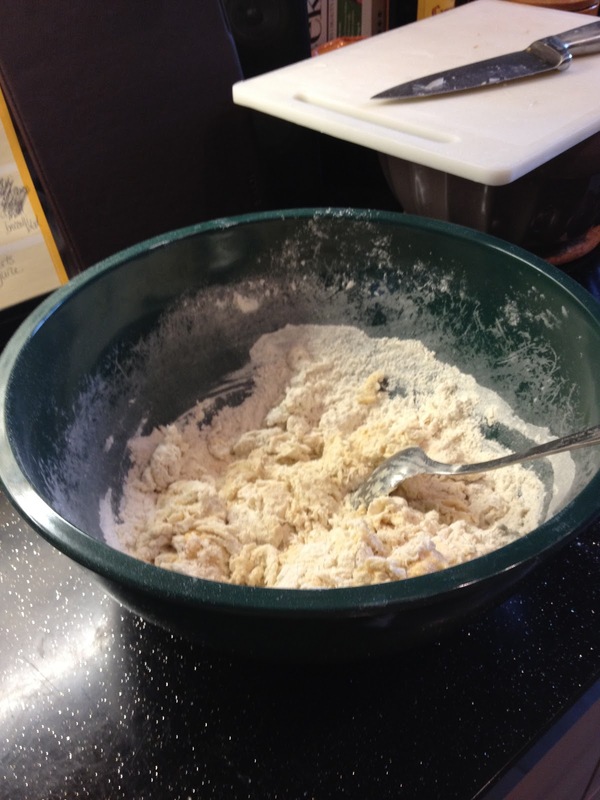 I like to use a pint glass to size them, so dip the pint glass in some flour and start to make little circles. 3. Start boiling some water in a medium size pan. Once it's come to the boil, drop the pierogies in, no more then 5-6 at a time. Once the pierogies float to the top, use a slotted spoon to scoop them out. I then put them on some parchment paper while finishing the rest. 4. Then you could just fry them in a pan with butter, but I like to first cook up some chopped up smokey bacon, and some white onion, when they are about half way being cooked I add the pierogies in and let them brown on one side, then turn them over. Once nicely cooked I take them out and serve with a bit of sour cream. Sometimes I will also serve it with some Polish kielbasa sausage! 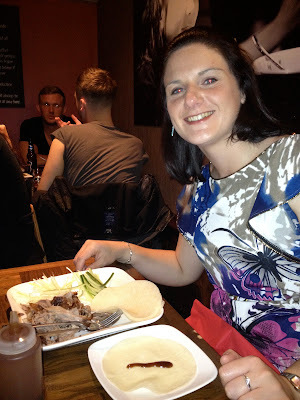 Karen celebrated her birthday in Newcastle!!! Yaayaya! My dear friend Karen brought herself and the Aberdeen crew down to Newcastle for her birthday weekend in September! When the lot of us are together we always have some fab food excursions! 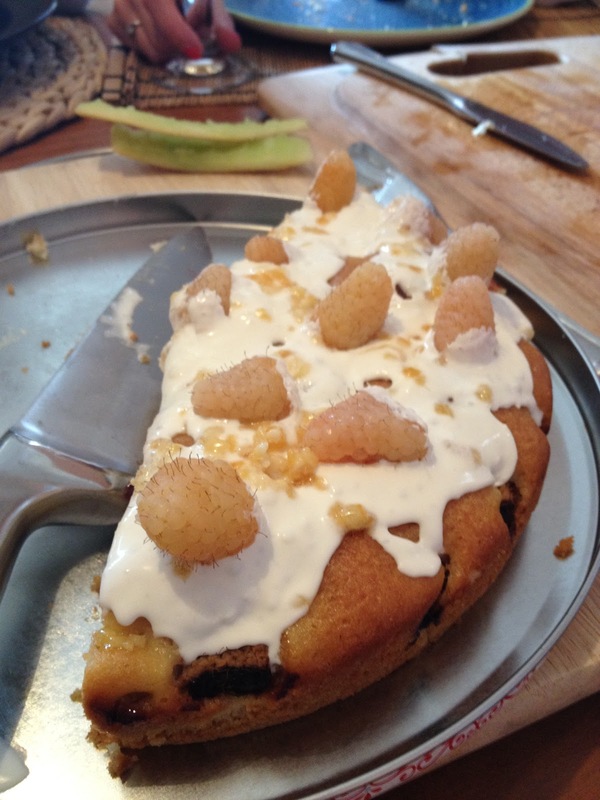 We went to Nudo for supper, but on her birthday morning I made mimosas, fresh croissants and a delish fresh raspberry cake! Pictures below!! the delish raspberry cake complete with crackle candy on top! Karen enjoying her birthday duck pancakes from Nudo! To celebrate a new friends new life in Newcastle we all went to his place for some drinks, closely followed by an interesting night as we stumbled across a fab hipster style dance party in a local church hall. 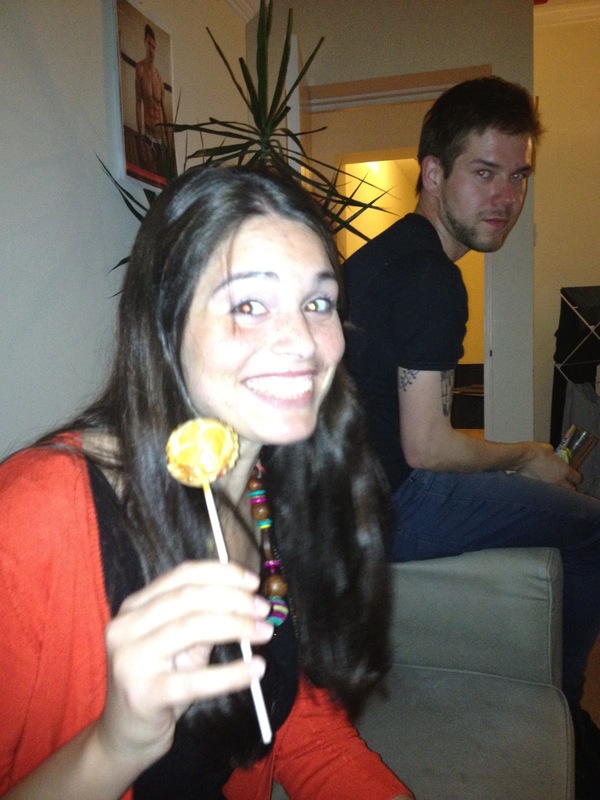 My treat to this party were Pie Pops!!! I have to say because I was short on time I cheated and used store bought shortcrust pastry! But I mixed the raspberries and strawberries with icing sugar all on my own before putting them on the pastry! The pics below are pretty self explanatory! The next recipe is one that was really simple but really delish! I decided to make homemade calzones! I cheated a little bit to save time and used my bread maker to make and proof the dough. But I do have a fab pizza dough recipe if anyone wants one! Photos below and rough recipe follows! 2. Once mixed and proofed, roll your dough out like you were going to make a small pizza. 3. Put a tiny bit of sauce on one half of the pizza dough. Then put half of your filling on that same one half. 4. Pull the other half of the dough over and pinch together at the edge. Then starting at one end, grab the edge of the dough from underneath and roll up to create a crust. Continue all along the edge. Do the same to the other calzone. 6. While the calzones are baking in the oven, heat up your tomato sauce. When the calzones come out, top with sauce and garnish with fresh basil. If you are a cheese fiend you could also put some more cheese on top! some of the ingredients I had around the house!!!! 1. I used some leftover sausages from the day before, if you're doing with from fresh cook your sausages and then cut them into little bits. 2. Put a tbsp of the chilli-garlic oil in a pan, add the sausage and prawns. Then add in the chopped kale. 3. After about 2 mins, add in the udon noodles following the cooking instructions on the pack. Stir constantly. 4. Once it is done, scoop into two bowls and garnish with fresh salad onions. Ok....I think I'm pretty much done for this post now.....mostly caught up....missing a few savoury recipes here and there but I'm sure I'll make them again sometime soon and share the love with all you fine folks! I hope you enjoy these tasty treats! Do let me know if you try any!